I adored it. Some how, some way, I had to have my own. I went everywhere looking for shadow boxes: DI, Joann's, Roberts, Michaels, but they had nothin'. So I went out to my garage determined to make my own. FAIL. So after batting my eyes at my husband, he made the boxes for me. Nail each side together to form a square and staple the back on. Paint everything white, disstress, then apply some stain or glaze wait a minute then wipe off. Glue some buttons in the middle box, glue the nose and two eyes in the top box. To make sure it was stable, I hot glued the boxes together. Display. Visit Poppies At Play for her more detailed tutorial. Found HERE. Have you ever head of the store in Murray, Utah called THE WOOD CONNECTION? I love this place. I could go broke if I shopped there everyday. Go HERE for their website. Anywho, this is were I got my "WINTER" wood letters. I painted them and jazzed them up. So cute! My winter display is complete! A while ago, I came across an awesome blog called high-heelfootinthedoor. 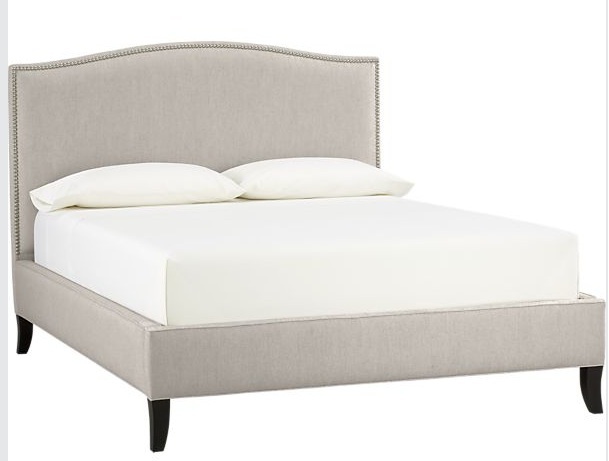 She found a bed called Colette at Crate and Barrel that she loved. But, like me, she didn’t want to spend lots of money on a bed, so she and her husband made a plan and made a bed just like it. You can find that great tutorial HERE. Once I saw the greatness of WINGBACK, I had to have one. So I went back to Google and searched for “wingback upholstered headboard tutorial.” NOTHING. What? NO tutorial? How could this be? Isn’t there someone out there that wants one just as much as I do? You can use fabric. This wasn’t the most economical route to go, but it worked out pretty well. My sister said the fabric I used looks like an old man suite. I agree, but I think it looks good. (1) extra long needle (Joann’s didn’t have them) $3.49- for the tufting of the headboard. (4) top plates the attach the feet to the headboard. Make a pattern for the type of wing you want. We traced it on cardboard and cut it out. The widest point of our wing was 11 inches. So we traced the pattern on(2) 11in wide by 4ft high MDF sheets. Using a jig saw, Matt cut out both wings. Place the wing on the outside edge of the head board. Next, Matt determined where he wanted the brackets to go. Three inches down from the top he put the bracket on the MDF and drilled holes in the where the bracket holes were, then screwed screws into those pre-drilled holes. He did the same thing 3 inches up from the bottom. Repeat on the other side. Then he pre-drilled holes where the bolts go. Two through the back in the corners then one though each wing though the bed fame. Make sure it is toward the bottom, so your mattress doesn’t hit them. Here is the bed all put together. We followed the tutorial for the bed and headboard. Follow my tutorial for the wings. At this point, Matt unbolted everything and we carried the bed into the house, then the headboard. Leave the wings attached to the headboard. Follow the Colette Bed tutorial on how to upholster the bed. These pictures speak for themselves on how to attach the foam to the headboard. We decided to make slipcovers for the wings. We figured this would be the easiest route to go. Use the cardboard pattern to trace the wing onto the fabric. Since we didn’t have enough fabric for one of the wings, we had piece the fabric together. I don’t even notice the seam. DONOT sew on the marker line. Add 1 1/2 inches to the line. We measured out 1.5 inches and made dots. This compensates for the foam. Sew on the dotted line. Cut off excess fabric then cut notches so the fabric will lay right. Slip the wing cover on the wing and tuck, pull and smooth until the fabric lays right, then staple. Here is what the headboard and wings looks like after it has been stapled. Tuck, pull and smooth the fabric for middle of the headboard until the fabric lays right, then staple in the crease at the sides. Make sure the staples don’t show. 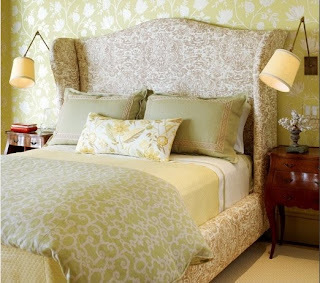 If you want your headboard tufted then you need to decide on a pattern. I wanted it staggered. Drill holes big enough for a needle to pass through. I found a random tutorial on how to do this. Finished! Good thing you predrilled everything, because it makes this next step easy. Attach the headboard back onto the bed-frame. Now it’s time to step back and salivate because your new bed is awesome! I love it! Thanks to Matt and my sister for all your help!